This month we had the opportunity to spend some time with some North West Region e-leaders to explore a number of simple techniques to use Powerpoint in the classroom as an interactive teaching tool. We were inspired by Rob Lewis from the British Council (previously blogged here) to have a go, and to work out what techniques he was using to speed up the production process so that we (humble educators) can, with little effort, become producers of e-learning resources. Ha! Is it really that simple? Let's review some of those techniques here so that you can mentally tick off what is practical and worth trying out - remembering that each time you make a Powerpoint presie, you'll get quicker and acquire new skills, be they keyboard shortcuts to speed the production process or clever ways to incorporate the presie into your teaching practice and/ or enabling students' access to that presie independently beyond the classroom. Here is a Vanishing Dialogue Presentation suitable for the language classroom. Using the above techniques will ensure that the actual production of the presentation will be quick and easy. Here is our Quick Vocab Quiz, again mimicking the techniques discussed by Rob Lewis. This is really simple to reproduce - I didn't bother with animated fly-in answers but, instead, created a duplicate slide with the answer. I trialled this one with my ESL3 students (all the items were chosen for their revision). They loved it and considered it a game - maybe that was also because I handed the cordless keyboard around the room for students to press Enter to Advance to the next slide. A resource like this one (which has a review/ revision function) could be stored on your server (on the Students' Drive) or on an internet hub designed for students' access, like a wiki, so that students can play the presentation 'on demand'. Here is Adjectives for People produced by Jane Lucas at CNLC: the 'Rolls Royce' version of the above quiz because she has had a go at pre-programming some fly-in animations. Again, the crucial time saving consideration is that once you have programmed one animation, you can copy this process for all the remaining ones. One way to revise and recharge basic grammar and vocabulary is to use simple power points. They’re attractive, fun and engaging for learners. The immediate visual impact appeals to a range of learning styles. Using special visual and aural effects can turn the usual slides into a fun challenge. This Adjectives for People Presentation uses bold pictures and questions with delayed, fly-in answers when the Enter key is pressed. It created lots of loud, often off-beat guessing, competition and laughter in my post-beginner ESL class. How will you incorporate these simple Powerpoint presentations into your everyday teaching? You'll need a PC or laptop, a data projector and possibly also a cordless keyboard (we talked about the Logitech model with a built-in trackpad). 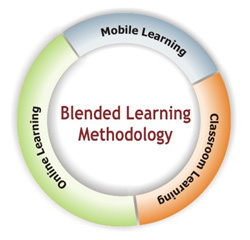 In its most basic form, this 'blended' learning doesn't require your computer to be connected to the internet. We're interested in hearing your reflections on your experiences with tailoring presies to the immediate needs of your students and how you manage use of these resources in the classroom. Have you got any examples to share with our readers? Feel free to email your thoughts to us or reply to this blog post.